Japan is a country rich in Buddhist and Shinto legends and mythology about nature. Trees—cherry trees in particular—have special significance. As the cherries bloom in Brooklyn, consider some of the interesting cultural associations of these trees and their blossoms, and learn about a few of Japan’s revered specimens. In general, sakura, cherry blossoms, represent the impermanent nature of life. Not only is the beauty of the flowers short and sweet, the trees themselves are also short-lived. But there are contradictory meanings as well. Cherry blossoms symbolize both birth and death, beauty and violence. They are a central motif in the Japanese worship of nature, but they have also historically signified the short but colorful life of the samurai. Sakura emblems also adorned the planes of kamikaze pilots during World War II. 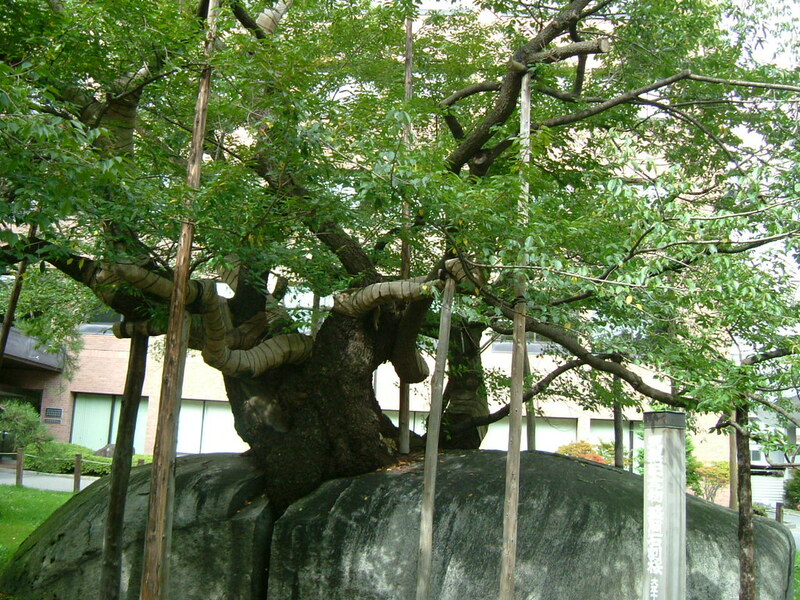 Sacred trees are often a theme in supernatural Shinto or Buddhist folk tales. Spirits, or kami, are said to inhabit old or beautiful trees, called kodama. There are hundreds of these trees in Japan, and to denote their sacredness, they are encircled with large twisted ropes called shimenawa. It is said that misfortune will come to anyone who cuts down or otherwise mistreats one of these trees. Many kodama are cherries. Some are purported to flower on particular anniversaries, like that of a samurai’s ritualistic suicide, or to possess people's souls. 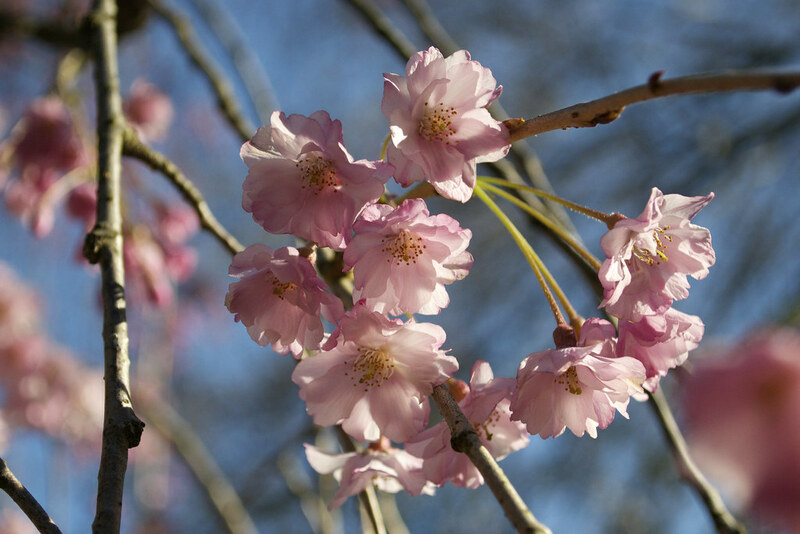 One of the most famous cherry tree myths is that of the Uba-zakura, or Milk Nurse Cherry Tree. It was said to blossom on the anniversary of the death of a devoted wet nurse who gave her soul (and life) to save a child she cared for. She lives on in the form of this tree. Turn-of-the-century Irish scholar and writer Lafcadio Hearn brought this story to the English-speaking world in his classic collection of folklore retellings, Kwaidan: Stories and Studies of Strange Things. Another ancient cherry tree tale concerns the ghost of a lonely samurai. In the district of Wakegori dwelled an elderly samurai who had outlived his children and all of his other loved ones. As he grew older and lonelier, his only comfort was the ancient cherry tree in his garden. He had played under this tree as a child, and it had been in his family for generations. One summer, the tree, too, died. The samurai grew more despondent, and on the 16th day of the next January he committed hara-kiri beneath the tree. His ghost entered the tree and made it bloom, and every year since, it is said to bloom again on January 16. Not so much a piece of folklore as a remarkable natural phenomenon, the revered tree called Ishiwari-zakura, or Stone-Splitting Cherry Tree, can be seen in Morioka, Japan. This tree took root in a small crack in a boulder and eventually grew large enough to split the boulder in half. Thus, the beauty and power of a tree was able to shatter stone. Today the tree is 400 years old. Brian Funk is a landscape designer and master ­gardener. He is also the curator of the Japanese Hill-and-Pond Garden and the Japanese tree peony collection at Brooklyn Botanic Garden. A Japanese friend told me that the cherry represented the samurai and that some persons placed in internment camps planted cherry trees as a symbol of samurai resistance. A sick cherry tree may have a form of malnutrition—try adding trace elements, like sulfur, copper, borax, zinc, cobalt and molybdenum. Holes can be formed by bacterial infections, fungus, or insects. If they form very suddenly, suspect a bug; fungi are usually slowest to appear but may have been developing for years. See if any other trees in the area are showing the same symptoms. Hi, Terri: Without seeing your tree and understanding the conditions it’s growing in, it’s impossible for us to identify what ails it with 100% accuracy. That said, your description matches the dark circular dots left by cherry leaf spot (Blumeriella jaapii), a common fungal disease that attacks cherry trees. For more information about the disease and to see if other symptoms match those of your tree, contact your local extension service. It can help diagnose your tree as well as provide management strategies. I have a Japanese cherry tree that is sick! I don’t have any idea what to do! The leaves have black spots and holes and fall from the tree . Any help? Prunus pendula ‘Yae-Beni-Shidare' at the north end of Cherry Esplanade. Photo by Blanca Begert. 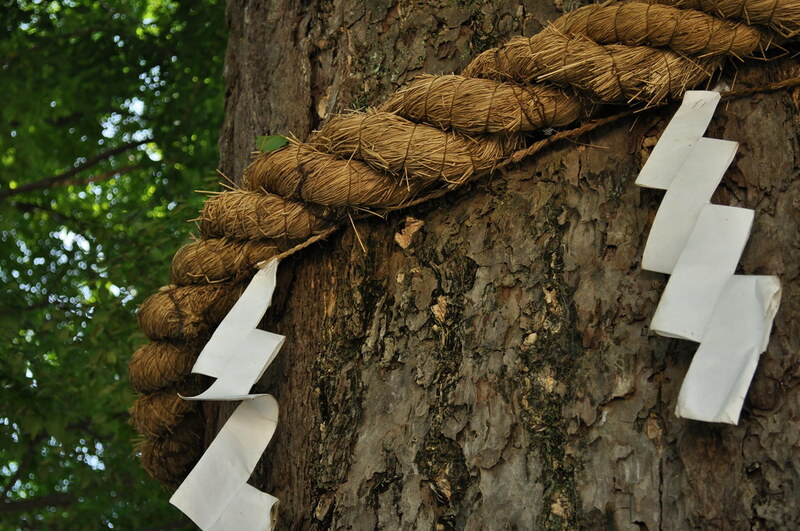 In Japan, sacred trees are encircled with a thick rope called a shimenawa. Photo by SC36. The 400-year-old Stone-Splitting Cherry in Morioka, Japan. Photo by Ümit Yaldiz.